Pride And Prejudice - This superb BBC adaptation from 1980 with lively performances, fluid direction, and a keen grasp of the wit of Austen's dialogue (expertly translated to the screen by British novelist Fay Weldon) and her satirical characters, who range from clever and kind t... read full description below. Pride And Prejudice - This superb BBC adaptation from 1980 with lively performances, fluid direction, and a keen grasp of the wit of Austen's dialogue (expertly translated to the screen by British novelist Fay Weldon) and her satirical characters, who range from clever and kind to utterly odious. Due to its faithfulness and deep appreciation of the material, this five-episode miniseries stands up as one of the best adaptations of this timeless story. Anne Of Avonlea - Anne of Avonlea continues the story of Anne Shirley (Kim Braden) the heroine of Anne of Green Gables as she begins her job as a schoolteacher and faces a whole new set of challenges... 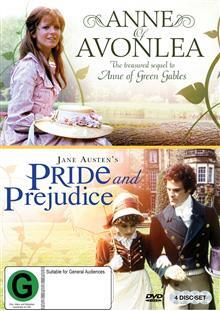 This acclaimed 1975 BBC six-part mini-series and sequel to Anne of Green Gables is based on L.M. Montgomery's classic novels Anne of Avonlea and Anne of the Island. It stars Kim Braden, Christopher Blake, Barbara Hamilton Madge Ryan and David Garfield.